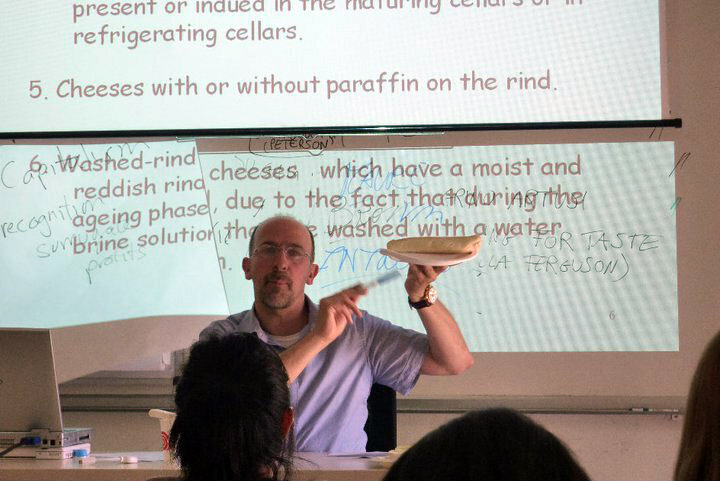 At the University of Gastronomic Sciences, some of my favorite classes were tasting classes. Not just because this meant eating chocolate for breakfast or drinking wine all afternoon, but because the lessons taught us what good quality means. We learned to distinguish identifying characteristics (including bad quality, like corked wine—a serendipitous lesson, since you can’t predict when a wine will be corked), and it introduced us to some of Italy’s most traditional and important products in their finest forms. Our cheese tasting lessons were taught by a passionate and diminutive professor who was also a member of ONAF, Italy’s National Cheese Tasting Organization. This man once recounted a hilarious story that ended with him running for his life from an eighty-four-pound rolling wheel of Parmigiano Reggiano. He took cheese tasting and sniffing to the realms of leather, unripe mango, clove, and cauliflower (no lie—looking at my tasting notes right now), evaluations of the shape, rind, eyes, and paste, and the structure and intensity of endless types of cheeses. His ringing question, “And the number one position?” (the primary taste) still comes to me unbidden at the most unexpected moments. We tasted salumi, chocolate, wine, beer, vodka, extra virgin olive oil, honey, and cheese. Everyone gravitated towards different foods or drinks. I later gravitated towards wine, but at the time of the university I decided that cheese, for me, was the number one position. I stopped by Fiorenzo Giolito’s shop in Bra and asked to volunteer. Fiorenzo, the cheese purveyor and consultant for Eataly, agreed. I helped package and cut cheeses and carry in barrels of nebbiolo marcs for his special Braciuk (“drunk” Bra cheese) which is aged in these marcs—one of my very favorites. I spoke with the English-speaking customers and practiced my burgeoning Italian skills with the ones who looked patient and friendly. Gradually, I began learning about the endless variety of cheeses in his shop that came from all over Italy. Fiorenzo sent me home with paper-wrapped wedges of cheese every day, and I gained weight within one week. It was worth it. The cheeses that I really remember are the Braciuk as well as uh-mazing Bra duro and Bra stravecchio (aged and longer-aged Bra cheeses, the local specialty made from cow’s milk); a squirming maggot cheese from Sardegna* that I did not try (a small part of me regrets my squeamishness; the rest of me is still squeamish); a heavenly mix of ultra-creamy mascarpone hand-stirred into Gorgonzola piccante; and a mystery cheese that I wish I could recall the provenance and name of: it was so smoked it was like meat that’s been left in the smoker for thirty-six hours. For anyone encountering Italy’s cheese scene for the first time, check out my article on The Grand Wine Tour, A Piedmont Cheese Epiphany, where I recommend my four favorite cheeses from Piedmont. All number one position. Wow – sounds wonderful! What an experience! Interesting and highly entertaining post. I did a cheese tasting in Cascina Amalthea in Mombarcaro a couple of years ago, and the memory of their aged bruz? still sends shivers down my back (not altogether pleasurable unfortunately;). Stinky cheese can be so memorable 🙂 Thanks for reading!